The tea in every cup of our chai makes a journey of thousands of miles, across mountain ranges and continents and oceans, to reach your mug. 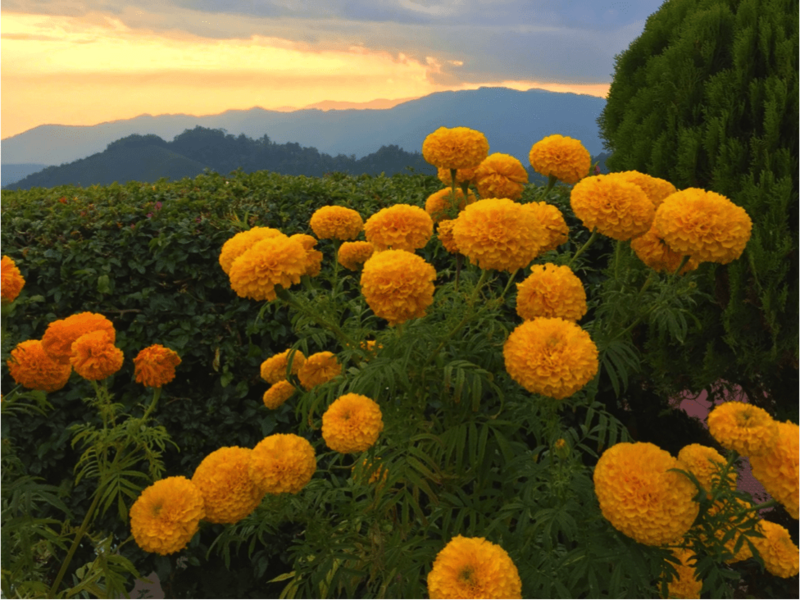 Twice a year, we make that same journey in reverse, traveling to the foothills of the Himalayas where our teas are grown, harvested and processed. We make this pilgrimage to ensure our tea leaves are responsibly sourced and of the highest quality. 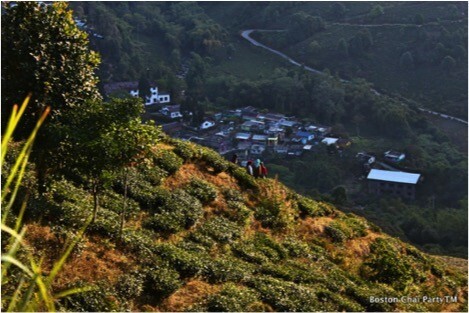 We meet not only with farmers and owners, but also the people who work in the tea gardens of Darjeeling and Assam. We visit not only the tea gardens and processing facilities, but also homes and schools and families. 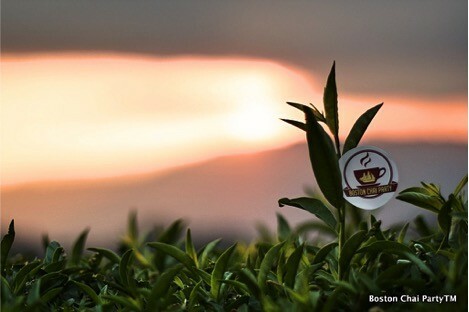 After all, we started this company because we care about where our tea comes from, and we know you do too. One of our founders, Vishal, has just returned from our Winter trip. If you’re curious and want to follow along, read on. The flight to India is an arduous trek in itself, involving long layovers, limited sleep, and cramped seating. All is rewarded, however, when I step off the plane and find myself into a new world of bright colors, warmer climes, and, for me, fam ily. 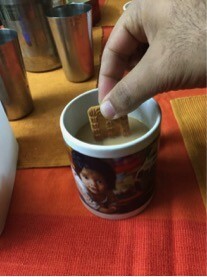 One thing more completes my welcome: chai with family along with some biscuits! After a day of rest and relaxation with family, I am ready to travel on to the remote regions where our tea is harvested and processed.This leg of the journey starts with a flight to the small town of Bagdogra in the foothills of the Himalayas where I meet my driver, Mr. Chandan and his Mahindra Xylo (the 4x4 equivalent of Jeep in India). This rugged car takes us up the long, winding and poorly paved roads into the mountains. Let me tell you this was one of the bumpiest, and scariest rides of my life. At some points, the incline was so steep that it felt as though we were on the verge of toppling over backward. Over other stretches the road grew so bumpy and patchily asphalted it hardly amounted to a road at all. 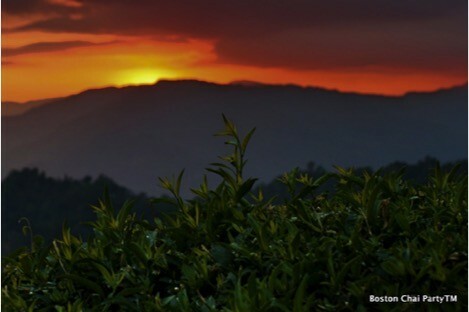 All this may seem excessive, but the best tea grows in rarified air, in climates found in higher altitudes. The higher you go, the more delicate the leaf, and the more expensive the brew. All different types of tea come from the same species, Camellia sinensis, of which there are two varietals: the sinesis and the assamica. 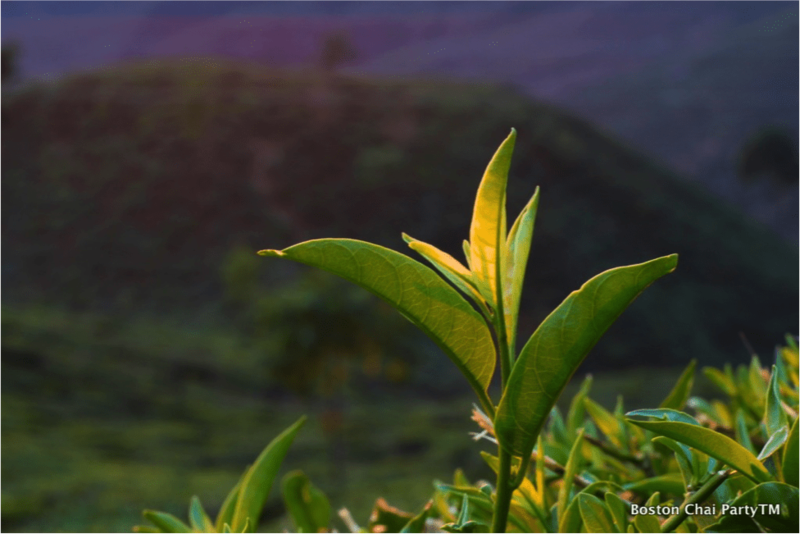 In India the predominant varietal grown is Assamica, from which white, green and black tea are produced using different oxidation and processing methods. Most black teas (including ours) are called crush, tear, curl (CTC) teas, referencing the production methods. This involves passing the lowland leaves through machines which render it into uniform nuggets. The resulting brew is dark and astringent, the perfect compliment to milk and our hand ground masala, or spices. As we climbed, the plains and CTC fields fell away. 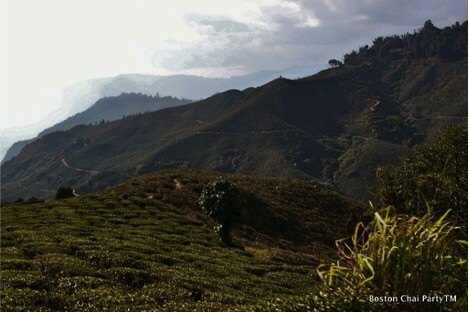 Ahead loomed the mountains, a smattering of rugged villages, and, of course, the tea estates. 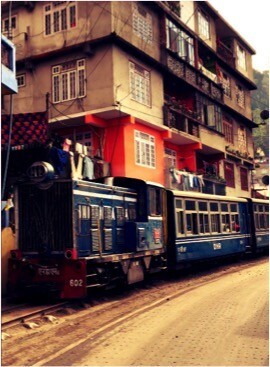 Up here, the only two ways around are the terrifying roads and the “toy train system.” Initially built by the British to transport tea down the mountains, these trains run on very narrow rail tracks connecting towns and tea gardens around the region. 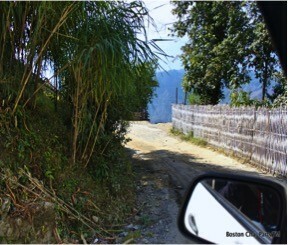 It was here that I finally reached my two destinations: Margaret’s Hope Tea Garden and Badamtam. Margaret’s Hope Garden is at an elevation of 5500 ft, and my guest house was at close to 5000 ft and surrounded by hills. It was a serene sight. The manager of the estate, Mr. Chattopadhyay welcomed me warmly. 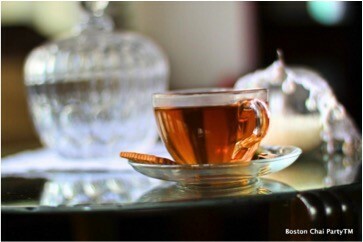 A cup of (what else) tea soon got us chatting about all things from tea to teaching bioinformatics in Boston. I settled in for the evening, drinking in a stunning sunset along with my tea. I woke early the next day for the tour of the gardens and processing facilities. Unfortunately, I arrived at the end of the fourth flush, or the fourth round of growth, meaning the bushes had all been plucked. While I didn’t get to watch the picking in action, I did get to wander through the bushes. I was surprised by how steep these mountainous gardens were. The workers traversed these slopes with an ease that would put the most experienced mountain climbers to shame! 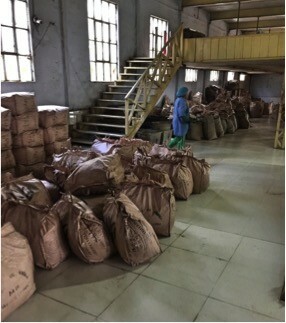 As we made our way to the factory I learned about the intricacies of timely harvesting and the features that help discriminate which tea leaves will eventually make it to the factory and which ones will be discarded. Before the greenery harvested here makes it to your cup it goes through extensive processing. First it must go through a withering and fixing step through which the green tea leaves are wilted, their flavor is enhanced, and the browning of the leaves is controlled through application of heat. After that the tea is oxidized, further intensifying the flavors and completing the browning process. The fully browned leaf is then rolled and dried to keep the finished product moisture free, and lengthen its shelf-life. This process has stayed the same for the last 100 years. Every single step has been perfected and extreme care is taken to ensure quality, as well as avoid contaminants from getting in or around these leaves. This is a source of pride for these gardens. They are also a source of some serious cash flow as the highest quality teas from the first flush can retail for as much as $850 per Kilogram. I was lucky enough to attend a tasting before I departed for my second destination: Badamtam. The second garden I visited was equally stunning. As my driver and I arrived we were greeted by a large Buddha statue which brings good luck to the gardens, and is worshipped by the locals. 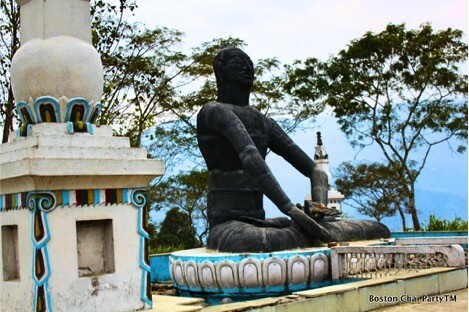 Different parts of the statue were made by different artists, shipped up into the mountains, and then assembled there. It was a welcome sight after our long drive. I met the manager, Mr. Sen, and settled in for the night. The next day brought more touring through the equally lovely garden. They used similar processing methods as Margaret’s Hope, and I was again treated to a tasting of their offerings. Mr. Sen challenged me to try identifying the teas I was tasting, and while I only succeeded on two out of the four I thoroughly enjoyed the experience. Before I left I had dinner with Mr. Sen and his family. I was happy to help his daughter who was applying to the US for college, and was treated to a veritable feast. It made saying goodbye the next day that much harder. The next day I began the long journey back to Delhi where my son and parents were waiting. I was lucky enough to have chai of a different kind on my long drive down the mountains. We stopped at my driver’s cousin’s house, where I was greeted in the traditional Indian way: with chai! Watching her brew the tea on her clay stove brought home for me how universally enjoyed Chai is around the world. Regardless of where you are, whether that be at the tea’s source in the Himalayas, around a clay stove on the side of the road, or back in Boston you can always enjoy a mug of Chai.